Replacing missing teeth as soon as possible is highly recommended, as sustained loss can lead to jawbone deterioration and a sagging facial appearance over time. Even life’s little pleasures like chatting with friends or eating a nice meal can become difficult. At Lakeside Daytona Dentist, Dr. Silva wants to help you regain a full and confident smile with a custom-made denture. We offer both traditional and implant-supported models, and your new prosthetic will be comfortable, stable, and affordable. Please contact us today here in Daytona Beach, FL to schedule a consultation. There are multiple categories of dentures. 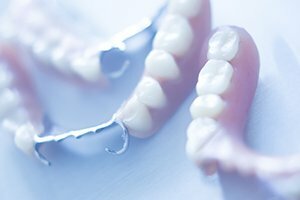 Full dentures are designed to replace an entire arch of missing teeth, while partials can replicate certain teeth along the arch while leaving healthy ones safely in place. We also offer both immediate and conventional prosthetics. 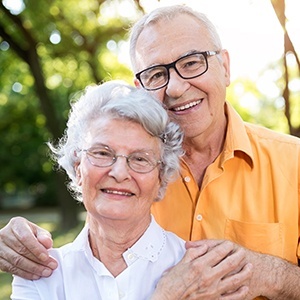 Immediate dentures are provided right after the removal of remaining teeth, while the conventional alternative is created after the teeth are removed and the soft tissues have healed. Dr. Silva strongly recommends implant-supported dentures over the traditional, removable style because of their valuable health and aesthetic benefits. Your new denture will anchor over the implants, eliminating any chances of embarrassing slippage or looseness. This modern prosthetic can either be fixed permanently in place just like your natural teeth or kept removable in nature.